More than 100 illegal pirate taxis plying local routes within Bulawayo’s central business district have been impounded by the Zimbabwe Republic Police over the past weekend as they intensify efforts to bring sanity to the transport sector. Pirate taxis continue to be a menace within Bulawayo central district with some allegedly forcing commuter omnibus operators to abandon their previous routes in suburbs such as Montrose, Burnside, Nkulumane, Luveve and Mahatshula. 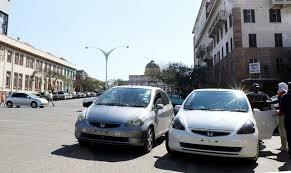 Speaking on the issue at Ross Camp Police Station, ZRP Bulawayo Deputy Spokesperson Inspector Abednico Ncube said most pirate taxis, particularly Toyota Vitz and Honda Fit models, are either mounted with fake number plates or have no number plates at all.